EA Sports plans to include real-life NFL referees in Madden NFL 14, according to two different sources close to the NFL Referees Association. One of them said the officials' facial features have been scanned into the game, with an eye toward making their calls and explanations a part of the broadcast presentation for next year's game. NFL officials are currently locked out by the league in a collective bargaining disagreement that has captured the nation's attention. It's unknown how that lockout may affect, if at all, plans for this feature. Two EA Sports representatives were made aware of the rumor but Kotaku received no comment on it. Publishers generally do not comment on rumored game features, especially this far out. From the description of what has taken place, it sounds as though the NFL's 17 regular game referees—the officials in white hats who announce penalties and make on-field instant-replay reviews—have had their faces scanned into the game, providing some variety during Madden's penalty and pre-game cinematics where the referees are most visible. The officials scanned are the regular NFL Referees Association officials, not the replacements currently officiating the league. Ed Hochuli, the NFL referee well known for his muscular physique, has served as the in-game motion capture model for Madden's referee since Madden NFL 06 on the Xbox 360 seven years ago. The actual referee in the game wears Hochuli's No. 85 but doesn't look like him in the face, is never referred to by name, and is basically considered a generic official. The same crew has appeared in the video game for at least two seasons. The umpire (No. 31) and head linesman (No. 28) seem to correspond to Hochuli's regular crew from 2005 (Chad Brown and Mark Hittner, respectively). The others, side judge No. 67, back judge No. 48, field judge No. 11, and line judge No. 55, don't seem to be have any basis in reality. It's unlikely the officials themselves would have any influence on a game, such as in how plays or penalties are called. 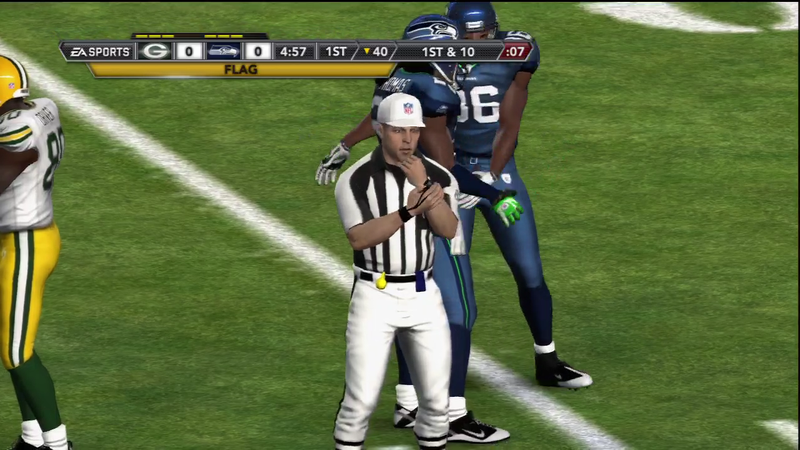 Sports video games that allow for variable officiating (that is, not uniformly governed by the game's engine or AI sliders) use fictitious officials, such as MLB the Show. Here, actual NFL officials would likely be a presentational element, and a presence for the new booth team of Jim Nantz and Phil Simms to comment on next year.